Opening Times: Open from Monday to Friday, 9 am to 5 pm. 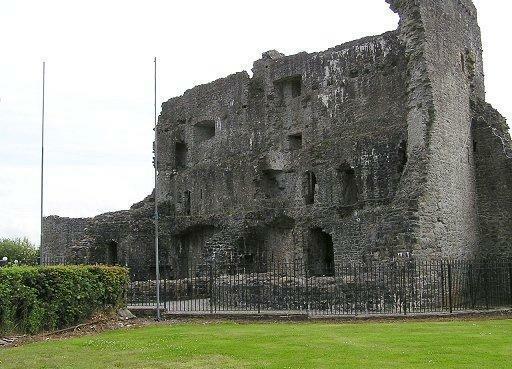 Notes: Ballymote Castle is a large rectangular keepless castle, built around 1300. It is located in the townland of Carrownanty on the outskirts of Ballymote in southern County Sligo, Ireland. This area was known historically as Atha Cliath an Chorainn, which roughly translates as The Ford of the Hurdles of Corran. It is the last of the Norman castles in Connacht. It was probably built in order to protect the newly won possessions of Richard Og de Burgh, 2nd Earl of Ulster (also known as the Red Earl), in County Sligo, some distance from an earlier motte. The castle is on the R296, Ballymote to Tubbercurry road, opposite the Ballymote railway station, and just past the Catholic church. Contact the Enterprise Centre, Grattan Street on 071-9183992 to get the key (for a small deposit). The Centre is open from Monday to Friday, 9 am to 5 pm, and frequently (at restricted times) on weekends in the summer. Access is through the grounds of the Ballymote Community nursing unit.